Protect fine polished knife surface with Painters Blue Tape. Abrasive particles from stone and also metal shavings dust may leave scratches. 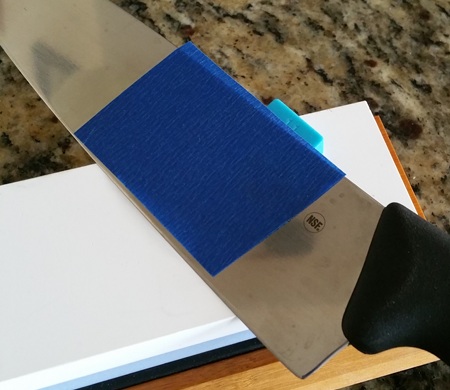 Apply Painters Blue tape on sides of the knife before sharpening. Even on very expensive sharpening systems people routinely apply blue tape to prevent scratches. So the method is not unusual. Some people may not like this extra step, but it is certanly worth it if your knife is polished and expensive. You can sharpen knife only once in several months (depending on usage). You should maintain ultimate sharpness every day by honing. Another thing is to wipe knife and guide with wet paper towel frequently. Take it as a rule to wipe every time when you change between stones. What if my knife is not polished? You don't need to apply blue tape if knife surface is not polished. I would still recommend to keep guides clean of any durt and abrasives though.